This bustling port city in Alabama has a history going back to 1702, when the French established it as a shipping centre. Mobile has a colourful history with a mixture of Spanish, French, British, Creole and African influences, and much of that is reflected in its architecture and culture. Many would be surprised to know that Mobile is the actual birthplace of Mardi Gras, and it still has its own unique party spirit, which makes any holiday in Mobile a lot of fun. 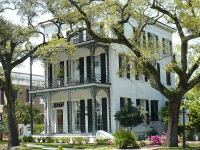 Historic buildings in Mobile are numerous, and include examples of Gothic revival, Greek revival, Beaux-Arts, Spanish Colonial revival, Victorian, Italianate, and Creole. The city is full of stately antebellum manors and grand churches that architecture enthusiasts will enjoy. A variety of museums showcase the city's history in other ways: Mobile has museums dedicated to World War II, Mardi Gras, the Mobile police and fire departments, and the region's ecosystem, among other things. The National African-American Archives and Museum is also located here. Mobile is a wonderfully verdant city, with diverse plant life that benefits from its mild subtropical climate. It has a number of pretty parks and gardens that prevent it from feeling too urban; some of the most popular are the Bellingrath Gardens, and Langan Park, which also houses the Mobile Museum of Art, Mobile Botanical Gardens, a theatre, and a golf course. Mobile is also a vibrant city with a buzzing nightlife. Known for its fantastic seafood and barbecue, Mobile has a variety of great restaurants serving either, or sometimes both. There are many popular bars and nightclubs, and the city boasts its own opera and symphony orchestra. Every October, the Ten Sixty Five festival hosts a number of exciting musical acts in downtown Mobile, this laid-back street party is free of charge and offers an abundance of entertainment and moreish food and drink options, catered by local establishments.